It is with equal parts delight and dread that I anticipate Pesach. The delight comes from being with family and friends for two food filled Seders where my adult child will read the 4 questions at the speed of light just to show me how well spent my religious school tuition was. Sadly I still have to spend 20 minutes negotiating with them for an afikomen that looks like it was hidden in the laundry chute. I do become a crazy lady in order to get it all done in time. Oh, did I forget to mention that I also have to clean and peel at least 20 dozen eggs no matter how many people are actually coming for Seder. For some reason I always seem to worry there won’t be enough eggs. Eggs are the one thing besides matzo that we tend to go overboard on during Pesach. There are conflicting reports from a multitude of agencies as to exactly how much or how many eggs a day or week are good for you but take my word for it, on Passover we all tend to consume way too many. Because of their leavening ability we tend to throw them in everything from breakfast to dessert. I say stop the egg-stavagance. The following Pesach recipes don’t contain any eggs. You heard me. 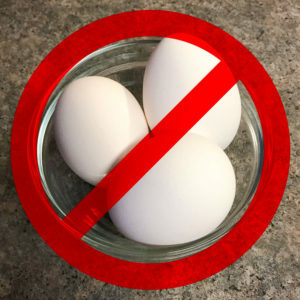 No eggs. Calories, yes, eggs absolutely not. You can use these recipes during the week or side dishes. They should be egg-actly what you need. Place all the dressing ingredients in a jar with a lid. Cover and shake vigorously then set aside. For the salad: In a salad bowl combine the lettuces and spinach mix to combine. Add the grapefruit, mango, avocado, and onion. Toss gently. Pour the desired amount of dressing on top of the salad and toss. 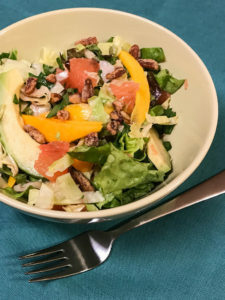 Sprinkle the chopped pecans over the top of the salad and serve. Serves 10 to 12. In a large sauce pan just cover the potatoes slices with water and cook them until they are tender (15 to 20 minutes), drain them, put the potatoes in a large bowl but don’t clean the pan. Place the oil, broth, wine, lemon juice and vinegar in the sauce pan and bring the mixture to a boil. Remove the dressing from the heat and pour it over the potatoes. Toss gently. Sprinkle the green onions and parsley on top, season with a little salt and pepper, toss to combine and serve. Serves 8 to 10. In a food processor or blender blend the cantaloupe for 10 to 15 seconds. Add the orange juice, lemon juice, and cinnamon. Process for an additional 10 seconds. Add the yogurt and honey. Process an additional 10 seconds. Pour into a bowl, cover and refrigerate for at least 2 hours. To serve place in a bowl and garnish with fresh strawberries. Serves 6 to 8. Cream of Cantalope soup?? WOW! What a great idea.